﻿It’s encouraging to see wine farms and estates, both established and new, calling on the expertise of talented chefs to create menus around their wines. Wine is generally consumed over a plate of good food along with convivial company whether at home or eating out. Modern thinking wineries have realised the importance of showing their wines in the best way possible…pairing the quality of their wines with skilfully matched food! Chef and owner Henry Vigar of La Mouette in Sea Point has a reputation for his personal perfection matching food around wine. So much so that this restaurant’s success is based upon his innovative menus where each course is based on a specific wine he has carefully chosen. No wonder wineries are clamouring to have their wines listed at La Mouette as they are certain they will be sold with confidence in the best way possible! So with this in mind, public relations guru, Lisa Manley, last week arranged an amazing wine pairing lunch at la mouette with wines from Oldenburg Vineyards. Oldenburg’s owner, Adrian Vanderspuy, explained at the lunch how his life had taken a full circle when in 2003 he purchased Oldenburg in the Banghoek Valley near Stellenbosch, which is the neighbouring farm to the farm he was born on! Despite spending most of his childhood overseas his parents brought him back regularly where they spent holidays on the family farm. With the wonderful memories of his times spent on the farm he returned in 2000 and recognizing the potential in the new South Africa he bought the Oldenburg farm. Adrian immediately set to work and had the soils analysed which came back with excellent results for the potential of growing outstanding quality grapes. He removed all the old vineyards as they were in poor condition after years of neglect and replanted with both red and white cultivars. Adrian’s aim was to establish Oldenburg as a premium boutique producer and to assist him with his vision he employed viticulturist and winemaker, Simon Thompson in 2004. “The geography, the soil and the climate all point to the possibility to make extraordinary wines. Here we have everything we need from nature, to make the best wines” commented Simon. He adds that the philosophy is to tread as lightly as possible and to craft wines with minimal intervention. “We strive to interact with nature in a sustainable manner”. 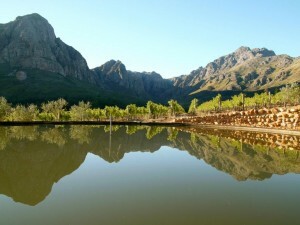 Oldenburg wines, which were first released in 2007, are made only with grapes grown on the estate and the range includes three red wines and two white wines. We tasted the five with the lunch and the wines received positive comments from the tasters present as the quality was outstanding as was the menu which complimented the wines. Difficult it was then to choose one wine out of the five but being a sucker for Chenin Blanc resulted in my choice!!! The Oldenburg Chenin Blanc 2010 was aged in French oak and offers subtle aromas of baked apple and lemon pie. The palate is crisp with creamy tropical fruit and delicate hints of vanilla on the long finish. Henry paired the wine perfectly with Cheese croquettes served with a tomato fondue, basil pesto and balsamic dressing. The wine worked well with the creaminess of the cheese while the vanilla complimented the herbs and nut flavours of the pesto.